Are we having fun yet? 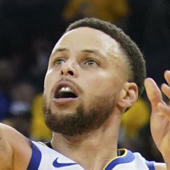 Tuesday night provided us with one of the most exciting moments so far of the 2019 NBA playoffs, as Damian Lillard sent the Oklahoma City Thunder packing with a dagger 3-pointer as time expired. Portland advances to the second round, and will play the winner of the close series between the Denver Nuggets and San Antonio Spurs. Denver got one step closer to meeting Portland by winning Game 5 at home, and they'll face the Spurs in San Antonio in a possible close-out game on Thursday. Also advancing to the second round were the Philadelphia 76ers, who eliminated the Brooklyn Nets on Tuesday, and the Toronto Raptors, who ended the Orlando Magic's postseason run.